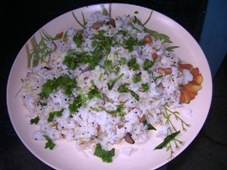 Mango Rice is an easy recipe and it is very tasty too. It can be prepared within few minutes. This rice can be used for office goers and school children. Heat up the oil in a heavy bottomed pan, and add mustard. When it splutters add urad dal, peanuts, red chillies (halfed) and curry leaves. Add turmeric powder (if you want a yellow color for the rice), and mix well. Add the cooked rice and salt. Mix well. Add mango scrapings and coconut scrapings, and mix well. After about 3-5 minutes, remove from the fire, and add chopped coriander leaves. While choosing the raw mango, care should be taken to see that it is not too sour. If too sour, this recipe will not taste well.